Drive from Windhoek via Dordabis, Uhlenhorst and Stampriet through the beautiful scenery of the Kalahari outskirts to Gochas. Afternoon nature drive. Visit the Fish River Canyon, the second largest canyon in the world. Thisngigantic ravine, in places almost 500 metres deep, has been gorged out of vast undulating plain in the course of thousands of years. Proceed to Lüderitz via Seeheim and Aus. This drive takes you through intriguing “moon”landscape of endless desert vistas and bizarre rock formations. During the morning visit to the “ghost town” of Kolmanskop where diamonds were first discovered in Namibia. Afterwards sightseeing in and around Lüderitz and drive to Klein Aus Vista. Dinner/bed/breakfast at Desert Horse Inn/ Bahnhofshotel Aus. 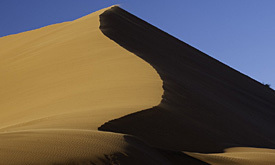 In the early morning depart on an excursion to the Sesriem Canyon and Sossusvlei, a large clay pan in the centre to the Namib Desert, surrounded by the highest sand dunes in the world. 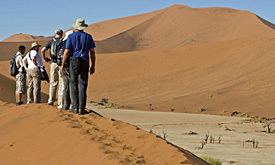 Arrive back at Namib Desert Lodge round about lunch time. In the afternoon take part in a dune drive. mirabilis, a living fossil, that is only found in the Namib and southern Angola, occurs in large numbers. Drive to the so called “moon valley” – a fascinating rock formation which is millions of years old. Arrival in Swakopmund at about sunset. Lunch packs en route. Bed/breakfast at The Delight Hotel/ Beach Hotel/ Hotel Probst or similar. After breakfast, depart to Walvis Bay for a boat cruise with sparkling wine, fresh oysters and snacks on board. Return to Swakopmund. In the afternoon city tour through Swakopmund and rest of the day at leisure. 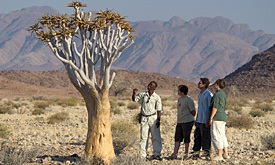 Drive via the tarred road into the interior, pass the Spitzkoppe and proceed to the beautiful Erongo mountain area. In the late afternoon sundowner drive. Dinner/bed/breakfast at Ai Aiba Lodge or Omandumba-West or similar. Early morning start for a three hours drive in open vehicles on the premises of the lodge. Numerous pre-historic rock-paintings will draw you into the spell of mystic Africa. Afterwards proceed to the Ugab terraces. Dinner/ bed/breakfast at Ugab Terrace Lodge or similar. 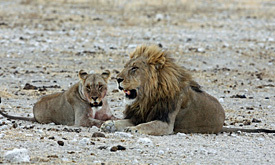 Trip proceeds to the famous Etosha National Park. First game viewing drive. Dinner/bed/breakfast at Taleni Etosha Village/Toshari Lodge or similar. One full day of game viewing in the Etosha National Park. 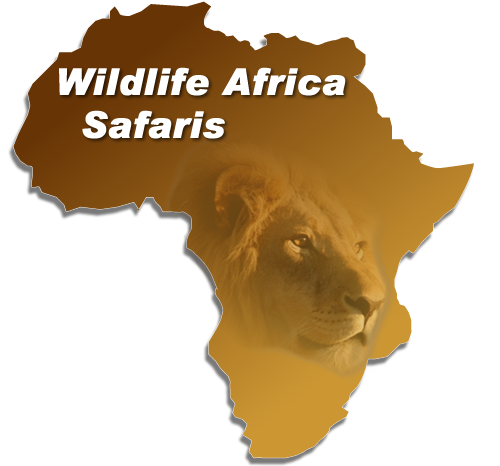 This national park is one of the major sanctuaries for wildlife in Africa. The area was proclaimed a game reserve as far back as 1907. 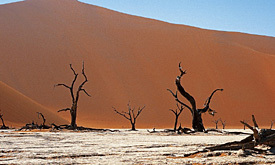 The size is 22.270km² and it consists mainly of bush and grass savannah. This type of landscape provides excellent opportunities for game viewing at the numerous waterholes or in the open countryside. The Etosha Pan, which the park is named after, is approximately 6.000km² in size. 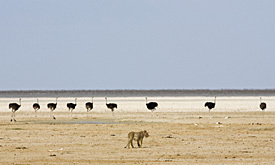 In the language of the Ovambo people, Etosha means “place of dry water”, or “large white place”. Dinner/bed/breakfast at Taleni Etosha Lodge/Toshari Lodge or similar. Enjoy another day in the Etosha National Park. After breakfast proceed via Tsumeb to the Gabus Game Ranch close to Otavi. En route visit Lake Otjikoto and the Mine Museum. Dinner/bed/breakfast at Gabus Game Ranch. After breakfast return to Windhoek via Otavi, Otjiwarongo and Okahandja. Arrival in Windhoek in the late afternoon.